Facebook is great because Facebook is free, right? Same idea with Twitter, YouTube, and a host of other social networks popping up all over the Internet. There’s no cost to join, and you get the ability to communicate with thousands of people all over the world. No wonder so many authors, businesses, and non-profits have jumped onto the social media bandwagon. But, are social networks really “free”? Or, could using them cost you big-time? There’s a basic economic principle that affects us everyday called “opportunity cost,” which is the cost of passing up another choice when making a decision. In essence, it’s the benefits you could have received by choosing a different action. What does this have to do with you and social networks? I’ve watched a lot of individuals and organizations become avid users of social networks who spend considerable amounts of time reading and maintaining their blogs, FaceBook pages, Twitter feeds, YouTube channels, etc. When you conservatively add up the hours spent spend surfing and contributing to social sites, the total amount of time can easily reach over 10 hours a week – and I’m being conservative! That’s over one-fourth of a 40-hour work week devoted to social networking activities. Some people claim they spend only 15 minutes a day. But, they’re shocked when they actually track their hours. My point is that if you’re going to spend over a fourth of your limited time on social networking activity, then that effort should create at least 25% of your total book sales. Yet, I don’t see that happening. At Book Expo 2009, John Sargent, the CEO of Macmillan Publishing stated, “Viral marketing doesn’t sell a ton of books.” He mentioned a video based on a Macmillan book that spent time in the #1 spot on YouTube in the U.K. Yet, it wound up only selling a whopping 200 extra copies. 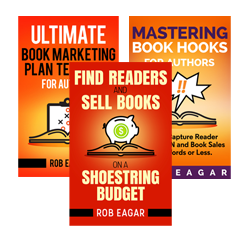 One of my author clients has a blog with over 50,000 monthly readers. He spends a lot of time maintaining his huge social network. However, none of his new books have surpassed the sales figures of his older titles. Instead, his book sales derived from social networking activities represent a trickle, rather than a torrent of revenue. Ironically, this author is continually surprised by how many books he sells via offline activities, such as public speaking, sending newsletters, or national radio and TV interviews. I remind him to stay balanced and keep the lion’s share of resources dedicated on tactics that truly work. The time has come to get pragmatic about the return on investment in social networks. If your online activity doesn’t create some form of significant revenue, then it’s time to re-focus on other marketing priorities. Notice that I didn’t say abandon social media altogether. I am not against social networks. Rather, don’t make them a prime area of marketing concentration. Social networks may help raise awareness. But, if that awareness doesn’t create direct actual sales, then it shouldn’t be a top priority. This may sound harsh, but it needs to be said. One reason why some people love social networking is because they lack the value, creativity, or promotional skills to actively engage their target readers. Instead, they prefer to sit passively at their computer chatting on social networks thinking that they’re actually marketing. In reality, they’re spinning their wheels and making little progress capturing new readers. However, if you want to increase your sales, then you can’t confine your communication to just online Facebook “friends” and Twitter ” followers.” Otherwise, you’re simply preaching to the choir. You’ve got to actively go out and make new converts. 1. Write and send a newsletter to influential leaders. connects your material to current events. could purchase bulk quantities of your book. who could provide an endorsement. 1. Send out 3 – 5 press releases. 2. Develop a creative promotional video. 3. Contact 3 – 5 authors or donors to coordinate specific marketing plans with their schedules. 4. Conduct research to identify new advertising opportunities. 6. Notify purchasing contacts at key retailers about upcoming author appearances. 7. Send galleys for 3 – 5 new titles to get reviewed in newspapers, blogs, or magazines. 8. Engage in a half day of self-development to learn new marketing or management skills. 9. Take time to gather reader feedback or success stories to develop new marketing hooks. 10. Contact 2 – 3 book clubs about carrying new titles. After looking over this list, what makes more sense to you? Why spend excessive hours trawling the Internet for electronic “friends” when you can get in front of real people who can immediately buy your product or service? The choice is yours. Social networking might be free, but there’s always a cost. Don’t miss the opportunity to maximize your time and your money.